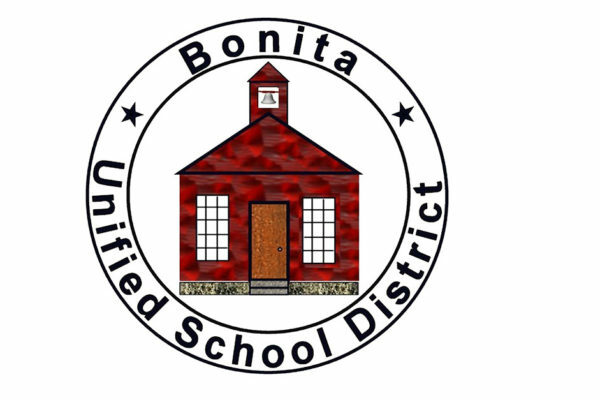 Bonita Unified covered the SAT registration costs for more than 600 students, prompting a 44 percent jump in participation over 2018. The District funded the SAT testing costs for all members of Bonita and San Dimas high schools’ Class of 2020 as part of Bonita Unified’s commitment to equity and to preparing every student to live their purpose. 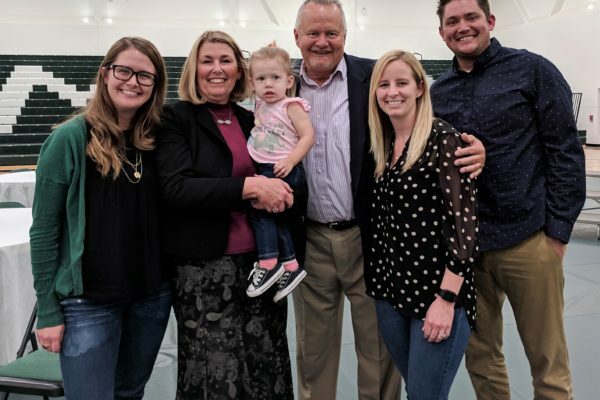 Bonita Unified celebrated retiring Board of Education Vice President Patti Latourelle on Nov. 27 during an evening filled with moving testimonials from community and District leaders who spoke about the tremendous impact Latourelle had on the school community over her 17 years of service. Latourelle, who was elected in November 2001, championed the expansion of career technical courses and programs. 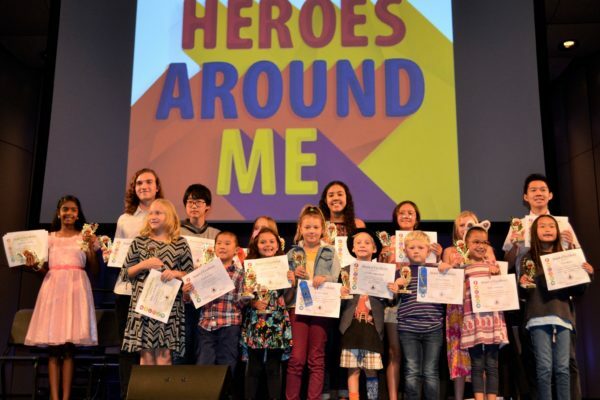 Bonita Unified School District celebrated student achievement in the arts during the district’s Reflections Awards Ceremony on Oct. 17. 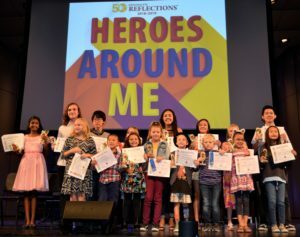 Parents, community members and staff recognized students who submitted entries in the National PTA Reflections Program, centered around the 2018-19 theme “Heroes Around Me.” Nineteen Bonita Unified students earned Merit of Excellence awards and will advance to the First District competition in November. For the students in our care, and in partnership with the community, we will create a safe, challenging and comprehensive learning environment that will shape character, nurture intellect and build skills for success in an ever-changing world. The District will develop and implement programs to shape character, nurture intellect and build skills for success for ALL students. Bonita Unified’s elementary school choirs will ring in the holiday season with four performances on Monday, Dec. 17 and Tuesday, Dec. 18. Oak Mesa and Shull elementary students in the Allegro Honor Choir will perform at 5:30 p.m. Dec. 17 at the Bonita Center for the Arts (BCA). Grace Miller and La Verne Heights elementary students in the Allegro Honor Choir will showcase their skills at 7 p.m. Dec. 17 at the BCA. Gladstone and Ekstrand’s Allegro Honor Choir students will perform at 5:30 p.m. Dec. 18, followed by Allen Avenue and Roynon Allegro Honor Choir students at 7 p.m. at the BCA. Four Bonita Unified seniors earned perfect scores of 800 on the math and English language arts (ELA) sections of the SAT. Students include Bonita High School senior Celina Bernal and San Dimas High School seniors Daniel Farag, Aidan Ferguson and Aidan Phipps. The SAT is used in the admissions process at many colleges and universities. Bonita Unified’s Bonita High School will perform the popular musical “Guys and Dolls” from Thursday, Nov. 15 through Saturday, Nov. 17. Tickets are $15 for students with an ASB card, $17 for students without an ASB card and $20 for adults. For the first time, Bonita High School’s band will perform alongside the drama department for the musical production. Bonita Unified School District voters on Nov. 6 re-elected current Board of Education President Charles “Chuck” Coyne and elected Derek Bahmanou to the Board of Education, according to preliminary election results. 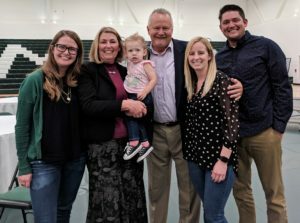 The College Board has recognized 11 Bonita Unified Class of 2018 graduates and a current senior as National Advanced Placement (AP) Scholars, highlighting a successful year for the District’s AP program as it continues to increase pass rates for AP exams and the number of students attending four-year universities. Bonita High School’s graduates named as National AP Scholars include: Stephen Brod, Rachel Cheung, Cynthia Dang, Garrett Palmer, Valerie Warner, Justin Woo and Monica Wu. San Dimas High School’s students include: Cameryn Baker, Aidan Ferguson, Ahmed Hasan and Jonathan Tsai. 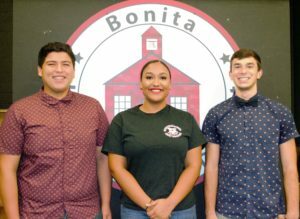 Luke Melkesian from Bonita High School, Naomi Pearson from Chaparral High School and Erik Vargas from San Dimas High School are the newly appointed Board of Education student representatives for the 2018-19 academic year. Melkesian, a senior at Bonita High and Associated Student Body (ASB) president, has taken seven Advanced Placement (AP) courses over the last three years. He holds a 4.25 GPA. Luke Melkesian from Bonita High School, Naomi Pearson from Chaparral High School and Erik Vargas from San Dimas High School are the newly appointed student board representatives for the 2018-19 academic year. All three students were sworn in at the Board of Education meeting on Oct. 3. The three seniors are active in campus clubs and sports, including the Associated Student Body. Bonita Unified School District students improved their performance in English language arts (ELA) and math on the California Standards for ELA and math, according to state data released Oct. 2. The 2018 state test scores show that 70.99 percent of students Districtwide met or exceeded state standards in ELA, up 3 percentage points from 2017, and 56.19 percent met or exceeded standards in math, up 2 percentage points.